Although this cookie is perhaps more appropriate for Christmas time, I wanted to list it now, because (I think) it turned out so nice. It is a large 6” gingerbread cookie that looks nice strung on the Christmas tree or tied to a holiday package for decoration. Merry Christmas?!? in June?! 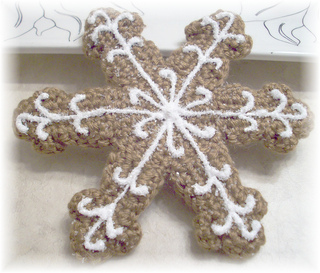 Maybe some of you crocheters are starting your Christmas crafting now while you’re sitting in the sun with a Pina Colata.